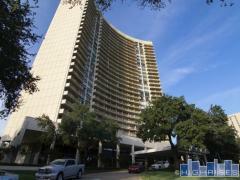 The Claridge Condos of Dallas, TX | 3510 Turtle Creek Blvd. A Dallas legend, The Claridge ranks in the upper echelon of quality and luxury for discriminating homeowners. Its timeless design has kept it at the top of the list for Dallas residents who are in the know. This building has a long list of low key, high-profile residents who appreciate the privacy and security that The Claridge offers. The building is in a very walkable location along Turtle Creek, directly on the Katy Trail and within easy walking distance to West Village. Amenities include concierge services, valet, fitness center and racket ball court, pool, and a club room with outdoor patio. Have any comments or questions about The Claridge Condominiums? Ask your question and/or share your thoughts about this Building. It's running about $1.54 per square foot per month as of June 2015, but that is subject to change. This is a full service building which is why it's higher than most other buildings. Do you have any leasing on property ?